Visit David G. Myers at his blog “Talk Psych”. 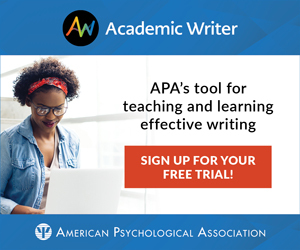 Similar to the APS Observer column, the mission of his blog is to provide weekly updates on psychological science. Myers and DeWall also coauthor a suite of introductory psychology textbooks, including Psychology (11th Ed. ), Exploring Psychology (10th Ed. ), and Psychology in Everyday Life (4th Ed.). Sounding smart is the great obsession of many college students. Through every form of complication and experimentation, they use words used by few to communicate to many. But readers and listeners are savvy, and judge those who use long words needlessly as bumbling rather than brilliant (Oppenheimer, 2006). To sound smart, it might pay to take a different approach: Use simple, concrete language that communicates your message while putting your audience’s mind at ease. How do you do that? According to Marc Brysbaert, Pawel Mandera, and Emmanuel Keuleers (2018), begin by choosing words that people use frequently. More than 80 years ago, psychologists noticed that frequently used words took the least mental effort to understand (Preseton, 1935). You have an easier time understanding artist compared with aardvark, which is understood more easily than the nonword Ockerbaijanian.ounding smart is the great obsession of many college students. Through every form of complication and experimentation, they use words used by few to communicate to many. But readers and listeners are savvy, and judge those who use long words needlessly as bumbling rather than brilliant (Oppenheimer, 2006). To sound smart, it might pay to take a different approach: Use simple, concrete language that communicates your message while putting your audience’s mind at ease. He was always disappointed, always self-critical, always an artist. The aardvark never knew life without food, without safety, without his normal routine. He was unkind, unethical, unworthy of being called Ockerbaijanian. Next, ask them to rate how easily they understood each sentence (1 = not at all easy to understand to 7 = extremely easy to understand) and the intelligence of someone who would write each sentence (1 = not at all intelligent to 7 = extremely intelligent). This is an extreme example, but it offers some telling discussion points. First, did your students show the word-frequency effect — that is, was it easiest for them to understand the first sentence? Did they also judge someone who would write that easy-to-understand sentence as highly intelligent? A second, hidden, point is that frequently used words enhance storytelling. Was it easier to imagine the inner workings of an artist than the daily activities of an aardvark? Did your students confuse the moral code of an Ockerbaijanian with that of an Uzbekistanian? Now you can begin to see why word frequency matters. When we see a word, its frequency plays a major role in whether we recognize it (Brysbaert, Stevens, Mandera, & Keuleers, 2016). Word frequency also lightens the mental load involved in making semantic (Does Ockerbaijanian refer to a person?) and lexical (Is Ockerbaijanian a word?) decisions (Brysbaert et al., 2018; Monsell, Doyle, & Haggard, 1989). Use frequent words and your readers will love you, but not because you’re the smartest person in the room. They will love you because your writing shows that you empathize with their dilemma: They want to learn but have limited mental energy. Who is most sensitive to word frequency? It isn’t people with limited intelligence (Brysbaert, Lagrou, & Stevens, 2017); it is people with limited language exposure (Monaghan, Chang, Welbourne, & Brysbaert, 2017). The more words you’ve encountered, the less your mind gets snagged on uncommon words. This makes intuitive sense. Imagine someone exposed to a million words and another person exposed to a thousand words. Which person will have to exert more mental energy to make sense of unusual words? The person who has seen fewer of them. 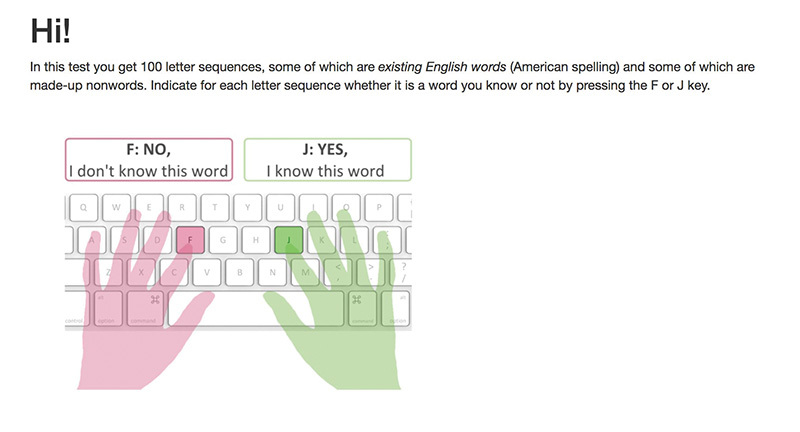 In this test you get 100 letter sequences, some of which are existing English words (American spelling) and some of which are made-up nonwords. Indicate for each letter sequence whether it is a word you know or not by pressing the F or J key. Please begin the task now. Ask students to form pairs to share their results. Did they know more words than they anticipated? Fewer? Based on their results, how much should they show the word-frequency effect compared with their peers? Why? People who sound smart commit time and energy to language. They expose themselves to as many words as possible, but they do not use needlessly long or complicated words. They communicate with empathy and appreciation for their audience, mindful of the power of frequent words to lessen mental load. And most of all, people who sound smart know when to end a sentence — even if they would rather go on. Wilmer, J. B. (2017). Individual differences in face recognition: A decade of discovery. Current Directions in Psychological Science, 26, 225–230. When we think about the dimensions along which humans differ, we tend to think of physical features such as height, personality factors such as neuroticism, and cognitive abilities such as intelligence. We tend not to think of individual differences in face recognition, which is defined as the ability to learn new faces so that you can later accurately pick them out among distractors. After all, we have had so much experience recognizing the faces of family, friends, and casual acquaintances that we feel like experts. In almost all situations, face recognition seems instantaneous and sure. Most of us have heard of the extreme face recognition problem of prosopagnosia, which is a major impairment in the ability to recognize familiar faces. When looking at a face, people with prosopagnosia can see the features of the face in front of them and can even recognize that they are looking at a face, but can’t determine whose face it is. People with prosopagnosia rely on other information (such as the person’s voice or hairstyle) for recognition, but these cues are not always present and tend to be less effective. Indeed, as one parent with prosopagnosia stated, “When my son started school, I dyed his hair so I’d know which kid was mine without having to be a detective every day” (Duchaine, 2015, p. 3). To sensitize students to difficulties in face recognition, construct a slide with faces of six familiar people (e.g., actors, politicians, local celebrities, and perhaps a student from the class or even a picture of you). Then, present these faces upside down and ask your students to determine how many faces they can identify. Despite clearly seeing the faces and their features, students will have difficulty identifying them. Next, present the faces right side up, and recognition should be immediate. If students want to know more, you can point them to a 2012 “60 Minutes” story on prosopagnosia. Beyond the extreme difficulties of prosopagnosia, are there individual differences in face recognition? Jeremy Wilmer, in his Current Directions in Psychological Science article, makes a compelling case that there are, and that understanding these differences has important theoretical and practical implications. face-recognition ability, ranging from people who have great difficulty recognizing faces (in the absence of brain damage; called developmental prosopagnosia) to people who are super-recognizers and can remember faces from even casual encounters years earlier. These variations are stable over time and are normally distributed. It’s unrelated to other abilities. Face recognition appears to be a highly specific ability that is largely independent of other cognitive abilities. Specifically, face recognition shows no correlation with IQ and limited correlations with verbal and visual recognition memory, thereby suggesting that different brain mechanisms are responsible for face recognition (Yovel, Wilmer, & Duchaine, 2014). It has a strong genetic basis. Face-recognition ability has a strong genetic basis. Evidence for this comes from the finding that face-recognition difficulties tend to run in families as well as research showing much higher correlations in face recognition ability between identical twins (.70) than between fraternal twins (.29) (Wilmer et al., 2010). Wilmer (2017) concludes that about 68% to 97% of the variability in face recognition is due to genetic factors. Developmentally, it’s up and down. Face-recognition ability improves substantially from the age of 10 to the age of 20, then peaks at the age of 32. After that, it slowly declines (Wilmer, 2017; see Figure 3 of Germine, Duchaine, & Nakayama, 2011, for average performance across age or access this figure’s raw data. These findings can serve as a foundation for discussing potential practical implications. One interesting possibility, raised by Wilmer, is to encourage certain professions to hire people based on their face-recognition ability. For example, Scotland Yard found that officers who had high face-recognition ability were much better able to identify criminals from public video cameras than were their counterparts. As students discuss this issue, they may want to consider whether such a screening test should include more diverse faces. Another possibility, based on research showing that scores on the Cambridge Face Memory Test predict eyewitness identification (Andersen, Carlson, Carlson, & Gronlund, 2014), is that eyewitnesses should be tested for their face-recognition ability. Also, given that matching photo IDs to faces is difficult, security officers might be hired on the basis of their face-recognition ability (Duchaine, 2015). Students also might be asked to consider how face-recognition ability affects a person’s social interactions and how changes in this ability across the lifespan might affect older adults. Brysbaert, M., Stevens, M., Mandera, P., & Keuleers, E. (2016). The impact of word prevalence on lexical decision times: Evidence from the Dutch Lexicon Project 2. Journal of Experimental Psychology: Human Perception and Performance, 42, 441–458. Monaghan, P., Chang, Y. N., Welbourne, S., & Brysbaert, M. (2017). Exploring the relations between word frequency, language exposure, and bilingualism in a computational model of reading. Journal of Memory and Language, 93, 1–21. Monsell, S., Doyle, M. C., & Haggard, P. N. (1989). Effects of frequency on visual word recognition tasks: Where are they? Journal of Experimental Psychology: General, 118, 43–71. Oppenheimer, D. M. (2006). Consequences of erudite vernacular utilized irrespective of necessity: Problems with using long words needlessly. Applied Cognitive Psychology, 20, 139–156. Preston, K. A. (1935). The speed of word perception and its relation to reading ability. The Journal of General Psychology, 13, 199–203. On the role of word frequency in understanding (or even thinking that you understand). I work with faculty from many different fields on making it easier for students to learn. It’s no surprise that students feel that natural sciences are hard to comprehend. The types of words in most science lectures are unfamiliar or just being learned by the students, and they would be feeling the impact of low word frequency during lectures or reading materials. It’s also the case that cognitive processing is temporarily interrupted when an unfamiliar word is included in lectures. I experienced the same stumble while observing a pharmacology class. While I knew what epinephrine and norepinephrine were to some extent, every time the instructor used either term, I had to stop listening and start making sure I was interpreting the term correctly. That was very disruptive to monitoring my understanding of what the actual point was. It probably causes that hiccup in understanding that adds to the cognitive load. Of course, in many fields one cannot help but use the terminology of the field. But perhaps a little more sensitivity to the novice’s processing at initial stages of learning may help with self-efficacy in those tougher low frequency word situations. C. Nathan DeWall is a professor of psychology at the University of Kentucky. His research interests include social acceptance and rejection, self-control, and aggression. DeWall can be contacted at nathan.dewall@uky.edu. APS Fellow Gil Einstein is the William R. Kenan, Jr., Professor of Psychology at Furman University. His research examines processes involved in prospective memory retrieval and how these are affected by aging. In 2014, he received the APS Mentor Award. Einstein can be contacted at gil.einstein@furman.edu.